At this year’s The Show 2018, Advertising Awards by Ad Fed Minnesota, Ciceron Digital Media Group won a silver award and was the only campaign to place in the GPS & Location Technology category. 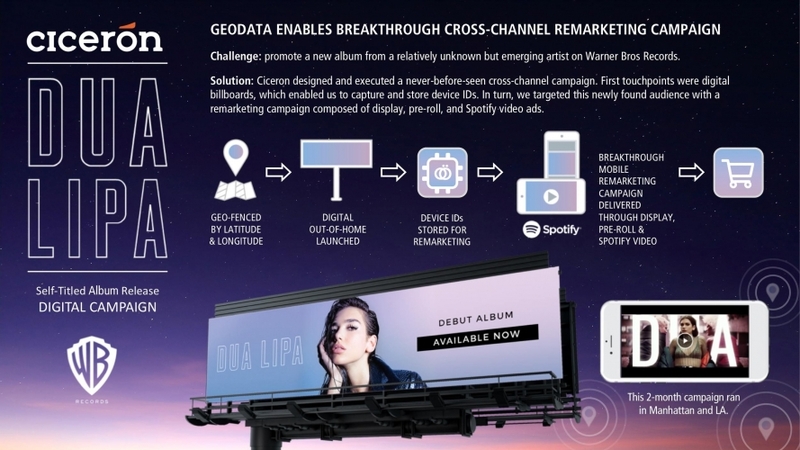 Receiving the award for their cross-channel campaign on behalf of Warner Bros. Records’ recording artist, Dua Lipa, their innovative remarketing strategy did not go unnoticed! To accomplish their campaign goals, Ciceron enlisted Vistar Media, Factual Inc., and Spotify. As depicted below, Ciceron used location data to execute digital out-of-home media, then used device ID passbacks to retarget on mobile through the Spotify app. Vistar came into play when Ciceron was seeking a partner to provide programmatic DOOH inventory. Ultimately, this two-month campaign in Manhattan and Los Angeles drove awareness and sales for the album release. Click here to check out the award and additional credits.